I love the National Sports Collectors Convention. Its the show of all shows. They don’t come any bigger and/or better. I know its only February, but its never a bad time to talk about the National. The 40th National Sports Collectors Convention will take place in Chicago this year 7/31-8/4. I regret to inform you that I won’t be attending. As much as I’d like to cover the show, see all of the cool stuff, and catch up with the awesome people, I don’t think its going to happen. I’m from central PA, and its a good 12-hour drive to Chicago. Flying is out of the question. I want nothing to do with airports. Atlantic City in 2020 seems like a better opportunity for me to get there. If it was up to me, I’d have it in Cleveland every year. That’s my all-time favorite location. One of the most popular activities collectors like to participate in is going after promotional cards. Every major manufacturer has something happening during the National. Collectors (myself included) have been known to wait hours in line for those precious exclusive packs. Today these promotional programs are all over the place. That certainly hasn’t always been the case. One of the earliest, if not the first promotional card set to be made for the National arrived in 1984. The National got it’s start in 1980, and was held in the Los Angeles Airport Marriott Hotel. By 1984, the show had grown and took place at the Aspen Hotel in Parsippany, NJ. Only (8) cards are in this exclusive set. They are Joe Collins, Willard Marshall, Larry Doby, Ed Lopat, Tom Gorman, Bud Harrelson, Bobby Thomson, and Gene Hermanski. On the back of each card it states “5th Annual National Aug. 9-12, 1984” inside a black apple. Beneath that it says “Sports Collectors Convention Aspen Hotel, Parsippany, NJ”. Like a lot of cards from this point in time, they aren’t worth a lot. You can easily find them for sale on the secondary market. A complete set can be found for $10. Its a neat snapshot of the National’s early years. We’re only 24 days away from the opening of the 2014 National Sports Collectors Convention in Cleveland. Things are starting to heat up. You know me, I’m all about free stuff and that’s one of the best things about the National. Panini has given us collectors a small glimpse as to what we’ll find inside those coveted wrapper redemption packs. Right now all we’re getting to see are base cards. For more pictures check out The Knight’s Lance. Panini plans to bring back their popular VIP Party which you’ll most likely need to spend a few thousand dollars on product if you want to attend. They’ll also have autograph guests at their booth too. 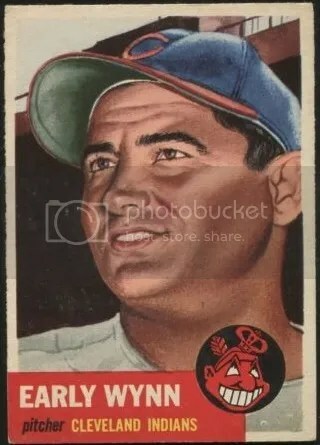 In my experience, Panini’s wrapper redemption programs aren’t something you need to rush through the door to participate in like some of the stuff you see with Topps. Panini usually holds their programs at specific times. Watch the lines!!! Collectors have been known to lineup 2 hours ahead of time. Ignite is a new product Press Pass plans to release in May of this year. 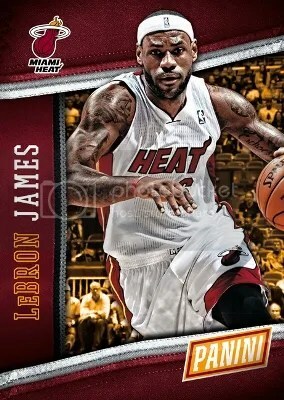 Collectors will find (20) packs per box with (5) cards per pack. Boxes will contain (2) “hits” – (1) autographed memorabilia card and (1) memorabilia card. 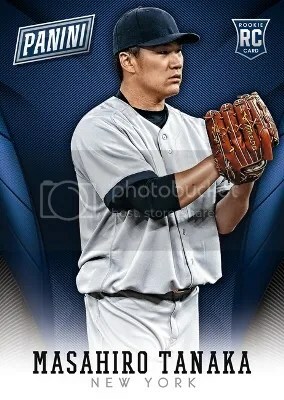 This will be the first set to include all new 2012 photography. 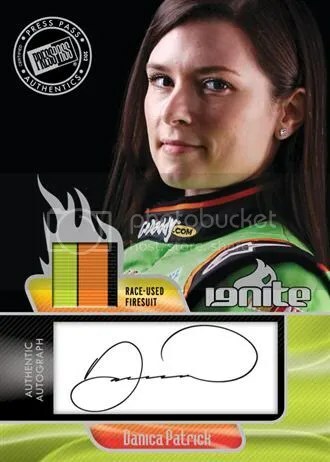 You can look for Danica Patrick’s NASCAR Sprint Cup Series rookie cards and autographs as well. 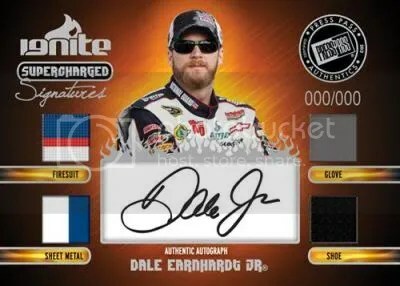 Ignite will also introduce the first autographed quadruple relic cards entitled Supercharged Signatures. One thing I’ve noticed over the years is how relics have been labled once they are placed into cards. When Upper Deck introduced the first jersey relics back in 1997, everyone thought it was the greatest thing since sliced bread. 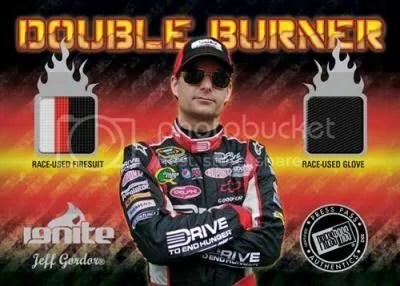 Companies then started to introduce multi-colored patches that just blew the plain colored jerseys out of the water. One thing that a majority of the manufacturers did was keep the lable exactly the same for patches as they did for jerseys. At the time this was ok, but in today’s hobby with all the fraud many counterfeiters take advantage of this opportunity. Take this Nolan Ryan 2001 Leaf Certified Materials Fabric of the Game patch for example. 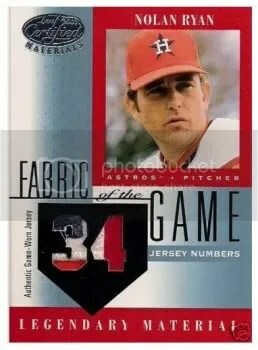 Donruss made patches for this set, but labled them “Authentic Game-Worn Jersey”. 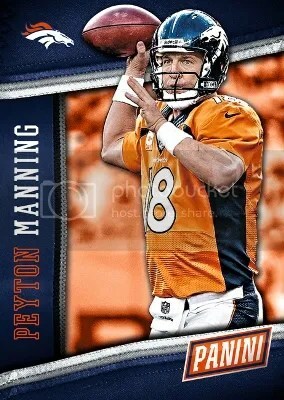 Most if not all patch cards made today say “patch” or “prime-jersey”. Usually if you see a patch card today that says “jersey” it makes you want to stop and think. This is just one of those little things you need to know before bidding on that special patch relic. Depending on the set and year, that patch may be real even though it may show signs on being fake.